Brenton D. Wynn, M.D. is a Musculoskeletal Medicine fellow at the Louisiana State University Health Sciences Center. He completed his residency at Stanford University Hospital specializing in Physical Medicine and Rehabilitation and Sports Medicine. He is a graduate of Howard University College of Medicine and maintains a bachelor’s degree in Physiological Sciences from UCLA. His sports fitness training stems from 22 years of martial arts experience. He is a certified instructor in the Chiang Lung Kuo Shu Kwan system of kung fu and in Kenpo Karate. In addition Dr. Wynn has extensive experience in Arnis De Mano of the Philippines, Capoeira Angola of Brazil, and Sanshou Chinese freestyle kickboxing. He has experience competing in, and preparing students for numerous tournaments involving empty hand and weapon divisions. 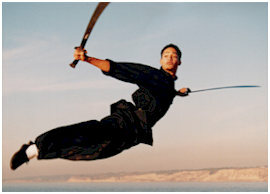 He has also performed extensively with the Green Dragon Martial Arts Demo Team and has been involved in martial arts choreography and stunt work for several motion pictures and theatrical productions. Whether you want to train in a specific martial arts discipline, aerobic kickboxing, and self-defense or develop strength, endurance and flexibility, Brenton will work with you to optimize your potential.